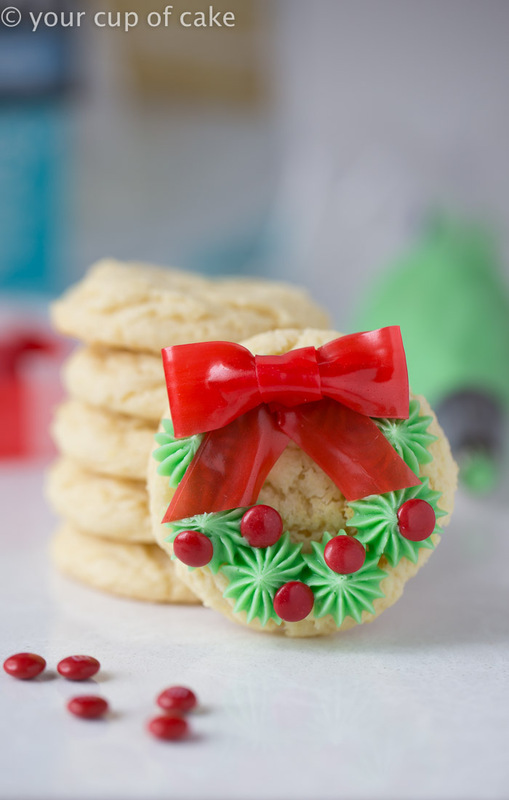 Christmas is right around the corner and cookie exchanges are in full swing! 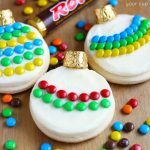 If you want a show stopper cookie but don’t have all those fancy decorating skills, these Easy Christmas Wreath Cookies are perfect! 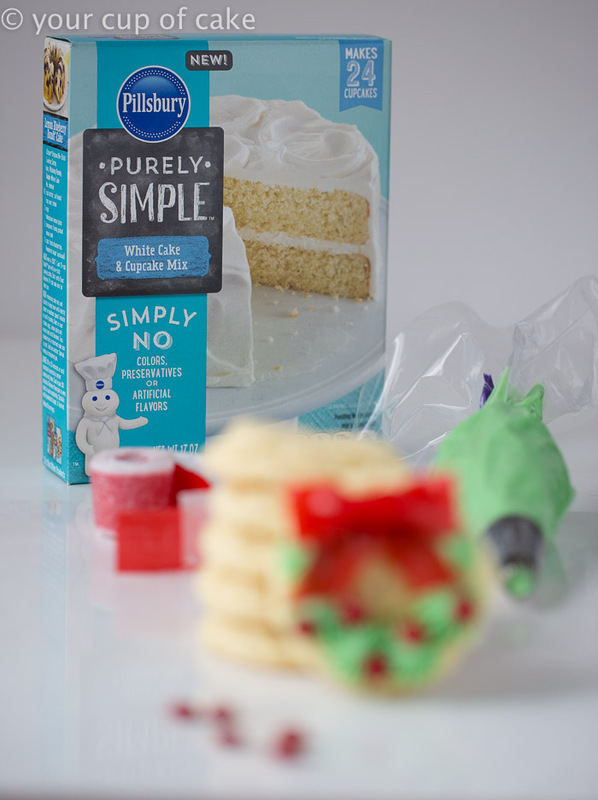 Plus, they use the new Purely Simple Cake Mixes from Pillsbury that I’m in love with! A homemade great taste but with no colors, preservatives or artificial flavors! This recipe will work with the regular mixes too if that’s what you have in your pantry already. It’s a cake mix but I turned it into a cookie mix with a few small changes. 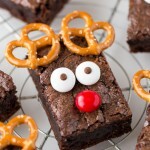 These look adorable and professional are really easy to make! Here are some step by step photos of how it all came together. And there will be a video up on my Facebook page later today showing an even more photos! 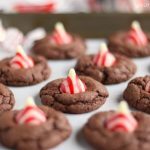 You need the cookies, green frosting (the tip I used is shown in a later photo), red candies like mini M&M’s or red hots or sprinkles and some Fruit by the Foot! But here’s a trick on the Fruit bow… Buy the Target brand because their’s is not as wide and never comes with designs cut in to the strips. You can also use Fruit Rollups and just slice the rollup with a knife to make pieces to work with! I did that the other week for another project and it worked great! 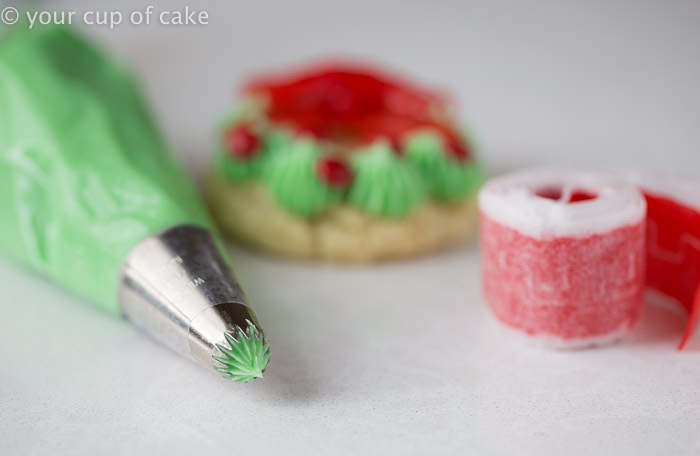 I used an open star tip for these but last year when I made some Wreath Cupcakes I used a different tip, so use whatever you have or just make little loop-d-loops all around! As long as it’s green, people will know it’s a wreath! The bows are easy to make because they just stick together! 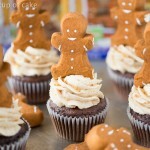 No frosting needed to make them stay together! Put them on cookies, rice krispie treats, cakes or whatever you want! Here is what those fabulous new Pillsbury mixes look like! 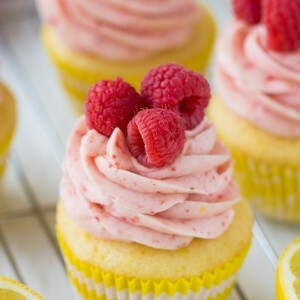 I’m seriously in love with them and obsessed with the fact that they are interchangeable with all my cake mix recipes! 1 box Pillsbury Purely Simple White Cake Mix or the chocolate cake mix! 1. Preheat oven to 335 degrees and line pans with parchment paper. 2. 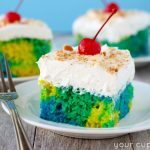 Combine cake mix, eggs, oil and vanilla extract. The dough will be thick so you can either mix it by hand to get a workout or use a mixer. 4. Bake for 8-12 minutes. 6. Frosting: Beat butter and 2 cups powdered sugar. Add more powdered sugar until you reach your desired consistency. Add vanilla extract and green food dye. 7. 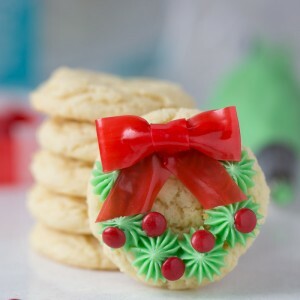 Pipe frosting on in a circle to create your wreath (piping tip shown in photo). 8. 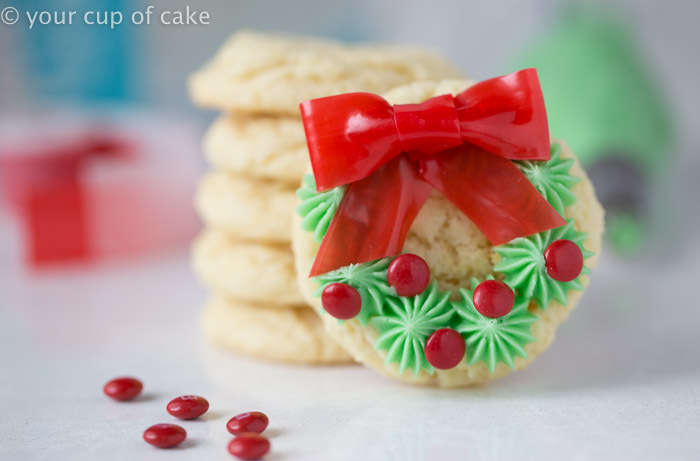 Use your Fruit by the Foot to make bows and then place those on top of the cookie wreath. 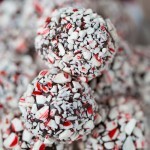 Finish off with red candies for your "berries." Thanks for the info on a new Pillsbury product I had not noticed. Will have to look for it. Adorable cookies!! 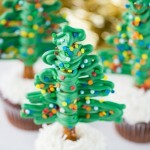 these would be so festive on our cookie tray! and I love how easy they are with the cake mix! These are just too adorable! 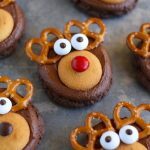 I am so not good at making cute cookies, but I think I could totally do these! Love them! These are SO CUTE!! You make it look so easy! Wow, these are SO cute!! I am a new subscriber and love your creativity and tips. I seen in a few posts about the scoopers you use for cookies to cupcakes. I seen them on amazon, but would like to know which color scoops to buy for just the cupcakes and different cookies. I truly would appreciate your help on this to make sure to buy the right brand and sizes ( colors).